Happy Monday friends! 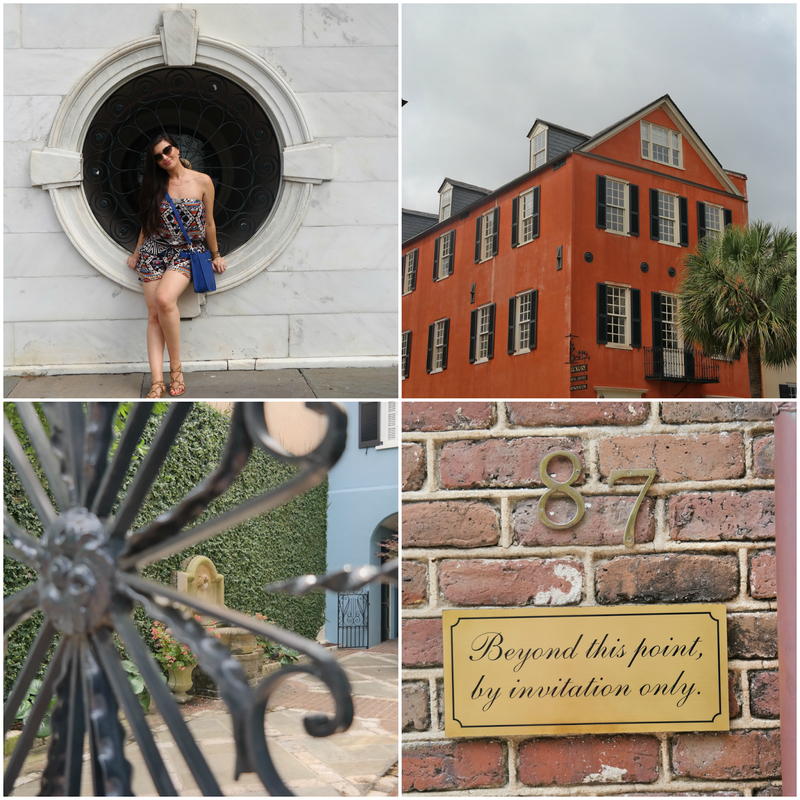 I'm back from a whirlwind long weekend in Charleston with Amanda and Pamela and a slew of other wonderful Charleston bloggers! We had a fantastic time exploring and eating our way through the city. We ate, laughed, fought lots of native critters and rather than go day by day I thought I would break it out into a few different sections starting with where to stay. Picture overload ahead - but well worth it! 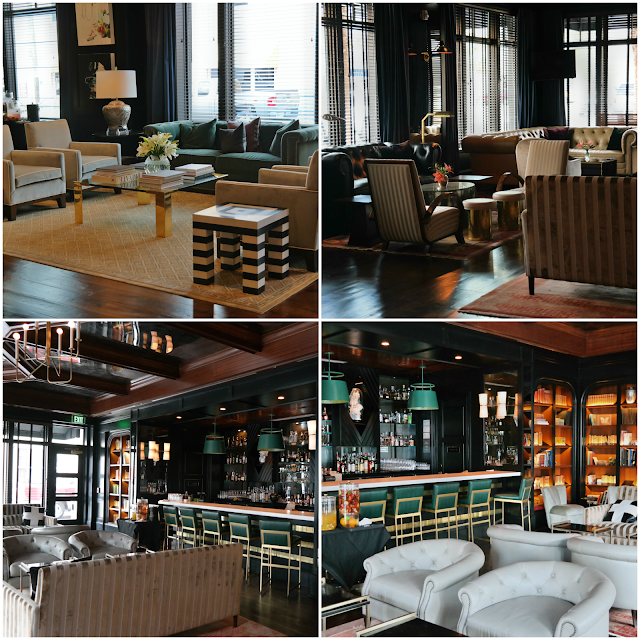 We were lucky enough to stay at the brand new Spectator Hotel that recently, as in three weeks go, opened on State Street. The hotel opens up to a grand lobby with styling that puts my table decor to shame! After checking in we were given fresh cocktails and led up to our room and given a tour of all the rooms features. 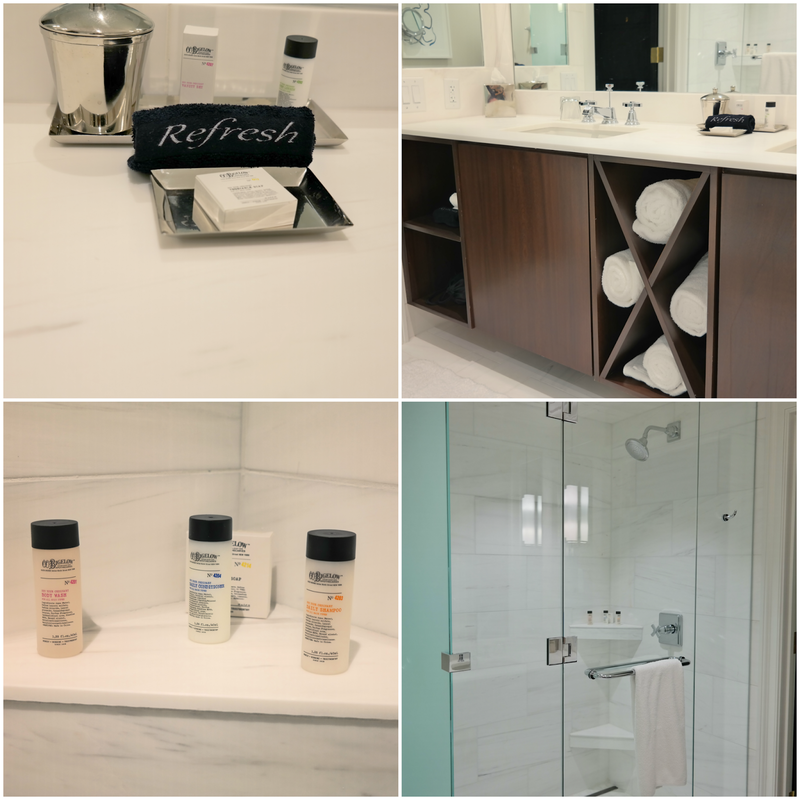 The hotel is old meets new with modern amenities throughout, including the most amazing bathroom I've ever seen - I'm talking Pinterest dreams bathroom! The staff, service and attention to detail was impeccable. Everything was done with care and thinking of the guest - from heated towel racks to mini emergency kits in your bathroom. 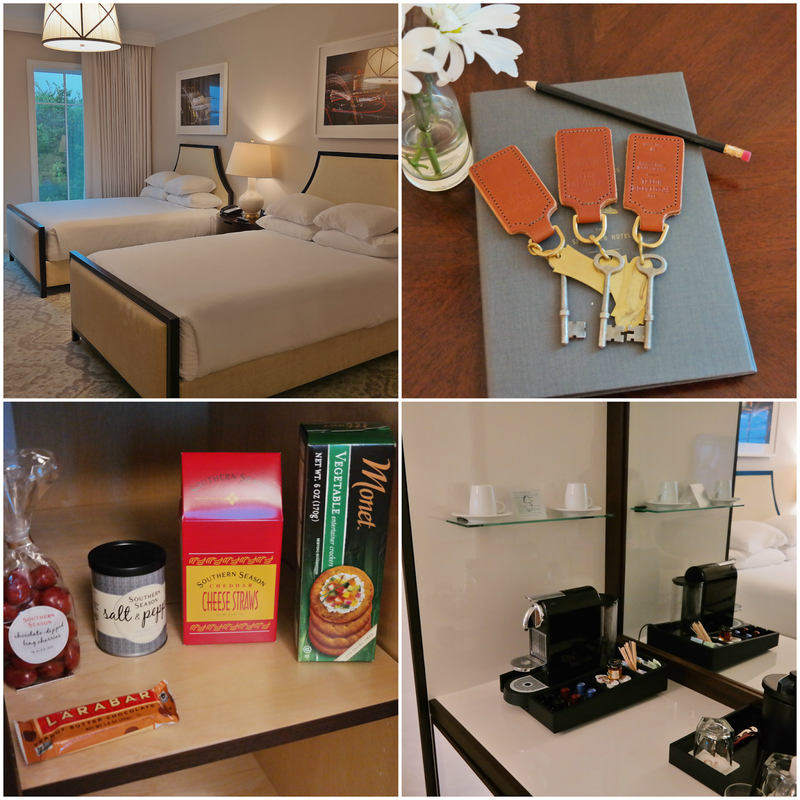 What makes the Spectator Hotel different from other boutique hotels is the personal touches like a butler assigned to each room and turn down service every evening! I could not recommend this hotel enough - they have thought of everything including artisan breakfasts of your choice delivered to your room every morning. If biking is your thing you can even take some from the hotel for the day - this wasn't an option for me since I still can't ride a bike - but I'm getting there! Every guest is treated like royalty and you almost forget that you should explore the city. We can't thank the Spectator Hotel enough for a wonderful stay - I will definitely be back! 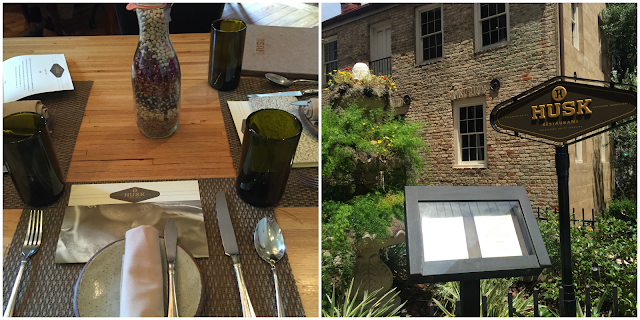 The food scene in Charleston is insane! Incredible restaurants on every corner and local spots that have been there for ages. We chose to keep it pretty traditional and eat where most tourists and locals like to take their out of town guests. HUSK: If you've heard anything about restaurants in Charleston then you've heard of Husk- we wanted to experience it but since it is pricey, brunch was a great option. Being farm to table everything is very fresh so much so there was a baby caterpillar in my salad- I'll spare you the photo but I know that Pamela and Amanda both devoured their delicious burgers! If it's a place you'd like to try I think brunch or lunch is better since there better dinner choices around. 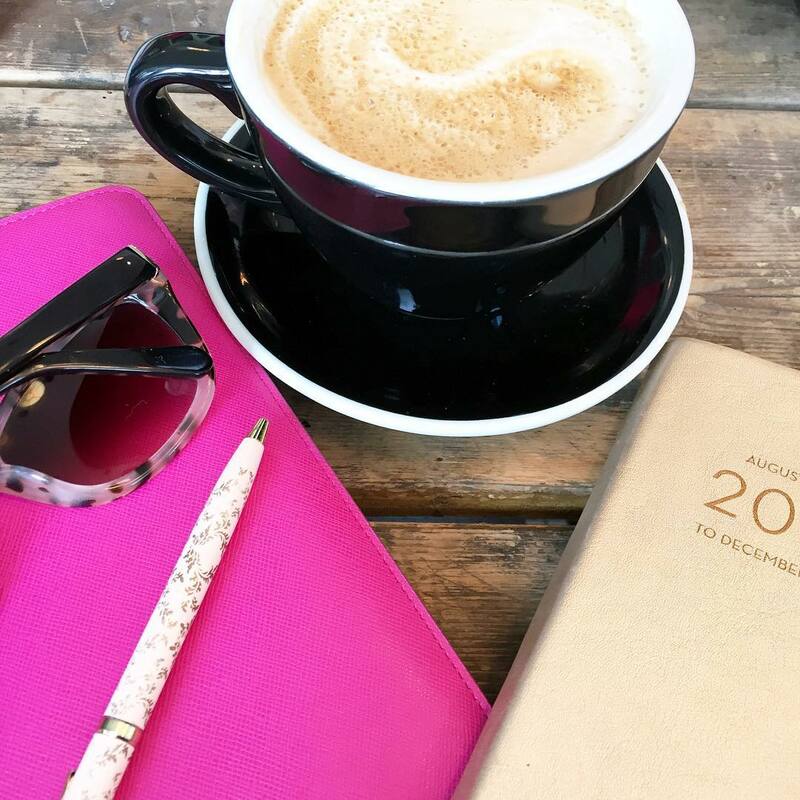 Poogan's Porch: What made Charleston such a great destination were all the great blogging ladies we were able to meet. Jillian suggested Poogan's Porch and it was amazing. I had dined there previously for a rehearsal dinner, but the brunch was out of this world delicious. I had the eggs Benedict with crab and it was cooked to perfection. The only downside is that it does get packed so reservations are a must! This was seriously the trip of weird bugs because there was a locust rattling under our table- I've never jumped so fast in my life to get out of my chair. I'm sad we weren't able to spend more time with the ladies, but so happy they made time for us! We didn't really plan any places to eat and winged everything and that worked out really well for us! Our dinners were well priced and all the locations were easy to get to! 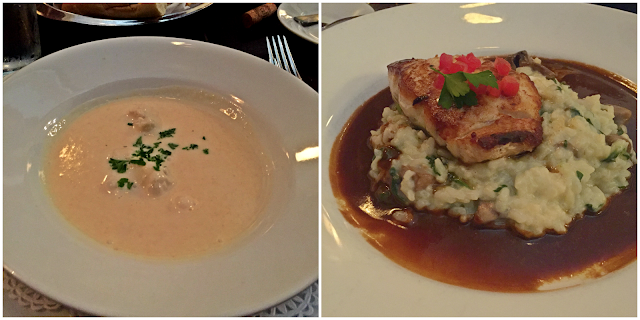 Hank's Seafood: On our first night I told the girls about Hank's which is an incredible seafood restaurant I ate at last year and one that I wouldn't mind revisiting- the She Crab soup and grouper with risotto did not disappoint and was definitely our fanciest meal the entire weekend. Another restaurant where you want to make reservations, but we ate super early so were able to get a table for 3 at 5:45! Vendue: Since we were meeting Shelby, Carly and Meg for drinks on the earlier side we decided to eat dinner at the rooftop of Vendue as well. I won't say it was out of this world, but it was tasty. We each got the same flatbread pizza, but it wasn't exactly as described because instead of kale we got arugula - not the same thing as much as they think it was. Taco Boy: I'm not sure I've had a restaurant recommended to me more than Taco Boy. It totally lived up to the hype. Thankfully it was a quick Uber to the Charleston location. The tacos were very fresh and they put an original twist on some classics. It was my first time having Mexican street corn and it won't be my last! The highlight of my meals for sure! It's easy to walk your way through the city and take in all the sights and that's exactly what we did. We walked so much (25,000 steps alone on Friday)! Having been there before I got my barrings pretty fast and sort of toured the girls to the spots I knew they wanted to see including rainbow row and the pineapple fountain. The architecture in the city is just gorgeous. We all loved that every alley led to a beautiful garden or enchanted house. A carriage tour was a must for us and really no need to make reservations since there are so many companies you can jump in on a tour with! Fun little fact - there are a certain number of horses allowed on the streets at a time so you have to wait your turn and there is s lottery to decide what part of the city you'll get to explore - we got the best one battery wharf! 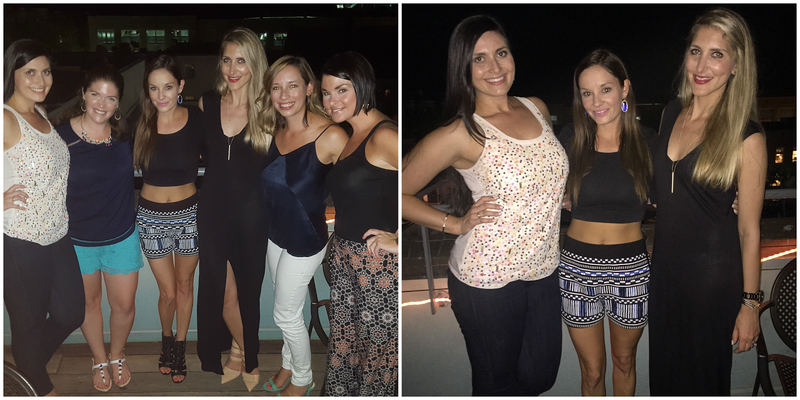 We almost had a running joke all weekend that we wanted to visit every roof deck in Charleston! Three in just as many days was a good number for us! Pavilion Hotel Rooftop Bar - Worth the trip to see the views, but beware of pricey drinks! Vendue Rooftop Bar - It's a great spot for drinks and there was plenty of seating which is hard to find at the other roof decks we visited. There is only one elevator to go up and down, so if you think there's s line it's only because the elevators run slow so it's worth it to enjoy there views. Stars Restaurant - Fun location, well priced drinks and great views of Charleston. The Cocktail Club - Shelby and Carly recommended the Cocktail Club and for good reason. There was a restoration hardware vibe with the decor and the cocktails were fresh and delicious! Both Amanda and I decided that we had the best Moscow Mules of our lives! We could not have picked a more perfect weekend to go to Charleston since it was Tax Free Weekend...a few purchases were made, but I'll highlight them later this week! Side note - it was hotter than I could have ever imagined and the Evian Mineral Water Spray was a life saver - I took it out every time the heat was rising and I'm sure the girls were loving it! I also figured out how to use Snap Chat this weekend so if you're interested in following you can find me @Blovedboston (Biana)! Thank you for reading this very long recap and I hope you enjoyed it! Hope you'll link up below to share your weekends with us! 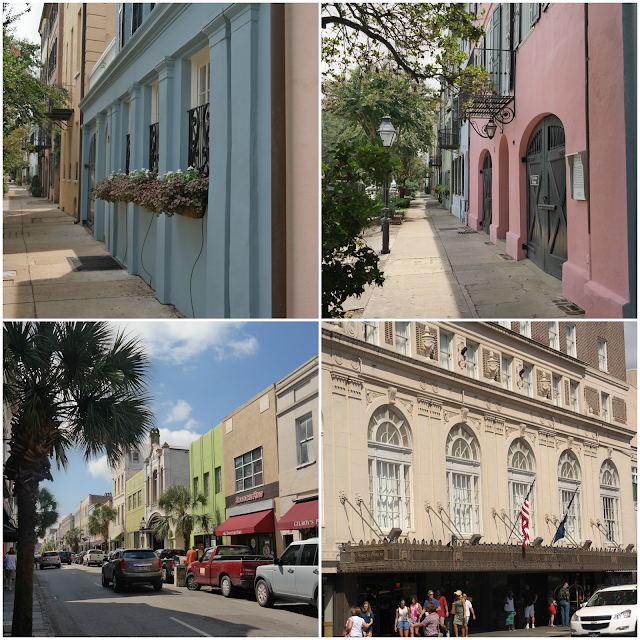 If you want to see my previous post on Charleston you can click here! Disclosure: We were provided with a reduced price on our stay in exchange for an honest review of the hotel. All opinions are my own. I am soooo jealous!! When I heard Shelby say the words "blogger brunch", I wondered if you all had been together at some point thus weekend!! Fun times and tacos too!!!! :-) You all have to be the prettiest bloggers in all of blog Land! Have a great week!! I had SUCH an amazing weekend with you ladies! Glad we were able to hit our rooftop goal :) And hopefully our creepy bug experience never happens again haha! 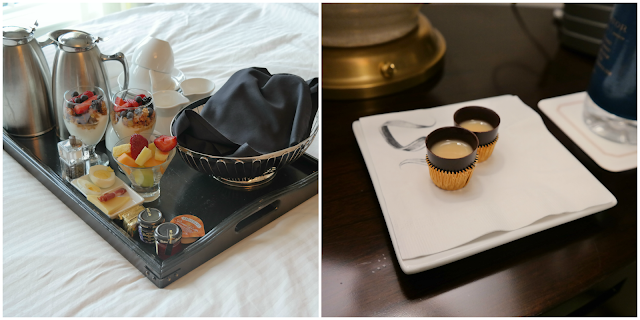 Definitely wishing I was back in our hotel bed right now... or at least getting ready for our yummy breakfast! It looks like you ladies had a fabulous time! I'm so happy for you :) That hotel looks incredible and is definitely on the top of my lost of places to stay when I finally get to Charleston!! I love seeing that pineapple fountain on everyone's recaps, it makes me so happy!! Wow, y'all sure did manage to fit a lot of things into your weekend in Charleston! I am so glad that you go to Poogan's Porch, Taco Boy, & the Vendue for drinks. Those are three awesome places :) I'm going to have to check out this hotel now... it looks awesome! We live love Charleston, but we always have so much to do when we are there that we don't get to see the town much. Love the hotel, does it have actual keys? And your brunch looks amazing, we will be going there next time we are in town! Great recap, looks like a blast! Love your photos and recap!! It was so nice meeting you, I'm so glad you guys had a great time! Charleston really is a foodie heaven. I'm going to have to plan a staycation at the Spectator... those bikes are adorable! Charleston is supposed to happen this Fall since our Spring plans were changed and I'm so excited to try out some of these places. Yay for tax free weekend and a little bit of shopping! Hope you have a fabulous Monday! Seeing all those food pictures makes me want to get down on the floor and do a plank with some burpees this morning ;-) Such a memorable trip! I'm sure you are so happy to be back and out of that heat even though it did sweat out that cold! Glad you got home safe even with the haunted airport and the lack of electricity! Well you're wknd post certainly puts mine to shame!! hahaa But i'm so glad you had such a wonderful trip. Charleston is one of my favorite cities. THe hubs and I like to visit at lesat once a year. We're planning an Oct trip, maybe that hotel will be our next choice! Thanks for sharing all of the wonderful experiences! I loved seeing all of the photos throughout the weekend. You girls certainly lived it up and had a great time! Charleston is amazing for food, sight seeing and great architecture. I hope the weather and humidity held up--Amanda's snapchat about the heat made me laugh. What an awesome weekend!! So neat you were able to meet up with other bloggers, too! Cannot believe that after all of that I missed y'all! Hope you had the best time – sounds like you did! Well now I want to take a trip to Charleston! Thanks so much for sharing this!!! Wow what a fun trip!! That hotel looks amazing, and all the food (minus the bugs!) sounds so delicious. Charleston is definitely on my must visit list! What an amazing weekend!! How I would have loved to have been there!! I loved keeping up with you girls this weekend via IG. It looks like y'all had so much fun and took gorgeous pictures!! Happy Monday! Looks like a fabulous weekend with the girls! All that food looks amazing, and that hotel is absolutely gorgeous! Love all the little details and how accommodating they were to you guys. So glad you girls had a fun trip!! I mean, it's hard to not have a good time in Charleston - it's the best place! Poogan's Porch was our favorite when we went last year but next time Hanks Seafood is a MUST - yummm! What a fun weekend! I just love Charleston and it looks like you guys had a blast! We love Poogan's Porch! So yummy! Your pictures are killing me!!! So obsessed with your hotel room may I add!!! I love Charleston! So glad you had a good time!!! Happy Monday! I am dying to go to Charleston. I have heard nothing but amazing things about the city and it looks like a city that is right up my alley. Plus Southern Charm is filmed there! lol So glad you had a fantastic weekend getaway! I mean.... this looks like a fabulous weekend with some of my fave bloggers. So much fun. You guys all look beautiful! What a beautiful town. Charleston is on my short list of places to visit! I'm glad you had a wonderful time, love your photos. So many of my favorite places in chuck town packed into one weekend, so jealous! What a fun girls weekend! I'm so jealous!! I've always wanted to visit Charleston! Your pictures are amazing! Sooooooo FUN! 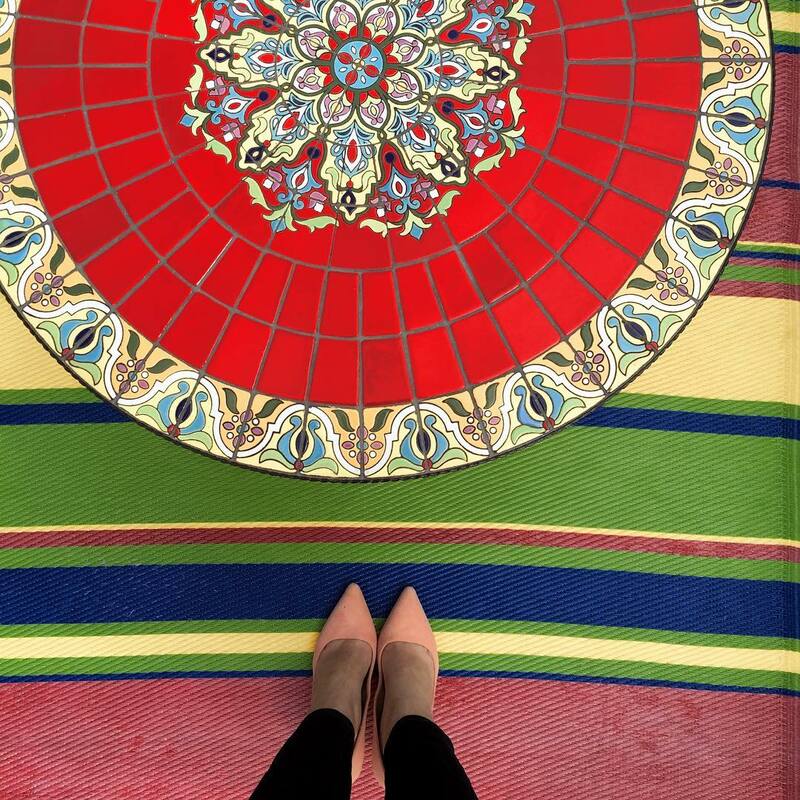 I loved following along on Instagram! I'm dying to go to Charleston someday! Definitely at the top of my wish list! Great recommendations! I'm going to Charleston & Kiawah Island in a few weeks! Wow, I've always wanted to go to Charleston and your pictures are amazing! Thanks for the recs, I hope to make it there someday!!! Looks like y'all had the best time! Loved following along on Insta! Yay! I love all the pics!! It was so much fun meeting and hanging out with you all. I'm glad I got to see a picture of the infamous "kale" on the pizza. So weird - get it together, Vendue. Y'all did Charleston right! We went to Charleston for our anniversary a few years back and we loved it so much there! We are actually going back in April for a wedding and I'm so excited!! It looks like you ladies had a fabulous time - that hotel is gorgeous! love charleston, it's so gorgeous! I love everything about this post! The places you visited and food you had (um, brunch?! Hello) look amazing. I LOVE blogger meet ups, and Amanda is one of my favorite bloggers so I can only imagine what a good time you all had together. Thanks for sharing your weekend! So fun! Loved following along on IG! Great recap... makes me want to go back already! Gah those photos are wonderful! I love how much you got to jam pack into one weekend... and be nice to your feet after all those steps! 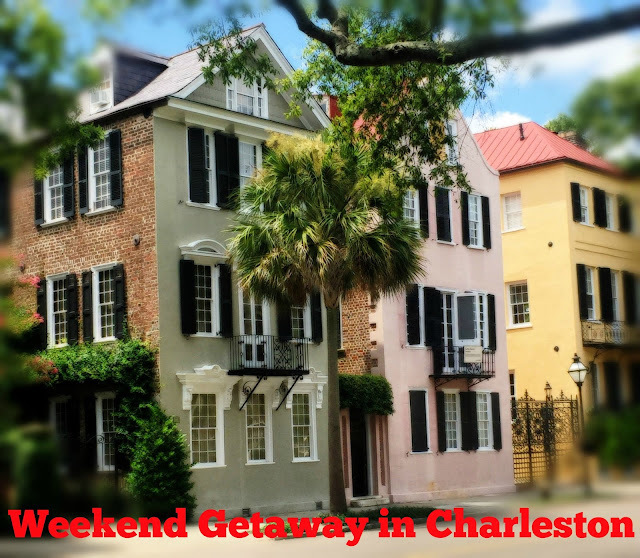 It looks like a beautiful weekend - I didn't realize how nice Charleston was or had all these wonderful spots. Looks like you girls had an amazing trip! Everything looks beautiful (and delicious!). Sounds like such a fun weekend! And that hotel looks gorgeous. She Crab Soup is one of my favorites, it looks delicious! I will add you on Snapchat...I'm just starting to figure it out myself haha! Happy Monday! Oh my goodness, it looks like you had such a fabulous weekend! Such great photos! I have always wanted to spend time in Charleston and definitely will refer back to this post if I make it. Thanks for sharing! This sounds like it was so much fun-- I loved seeing all of your pictures on instagram over the weekend. And now I have an awesome list of places to try out for the next time we go to Charleston. Charleston looks like such a cute little city! the trip for the food alone looks worth it (minus the extra protein of the caterpillar in your salad). I love the hotel keys! Little touches like that bring me a lot of pleasure! I have always wanted to visit Charleston! These pics are gorgeous!!! What a fun weekend! I am so jealous that you got to have a little girl's getaway. 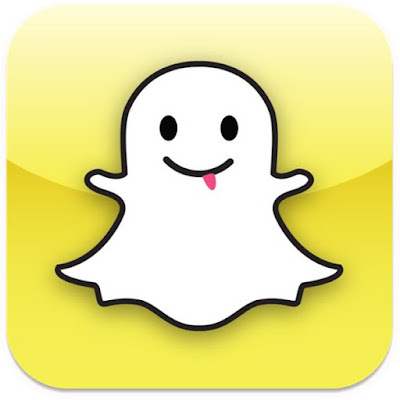 Added you on Snapchat. I am loving that thing! looks like a fantastic weekend! what a fun place to be! Glad y'all had a wonderful weekend! Charleston never disappoints! Charleston is on the top of my travel wish list. It looks like such a charming city! Looks like you had a fabulous weekend!!! I've never been to Charleston, but you brought up some awesome places to check out!! That hotel looks gorgeous, so well decorated and styled. Glad you had a great time and got to meet up with the girls! You have sold me on Charleston!! That hotel looks like heaven and it looks like you guys had an amazing time! What a gorgeous hotel, eats, and sights! Looks like a fun trip! Blogger trips are the best! This looks like such a fun trip! That hotel looks amazing! I was so excited for the recaps today! You girls look like you had an absolute blast! Thanks for all of the recommendations! That hotel looks gorgeous! I would definitely stay there. Are those the keys to stay there? I would want one just to keep one for myself. And I love that bathroom!!! I love that they provide bikes for you there. And don't worry you'll get there :) Sounds like such a fun packed weekend. Probably need a vacation from your weekend ! I would love to visit Charleston one day. I always hear such amazing things. It looks so picturesque! Your trip looked like a lot of fun. Charleston is on my list of places to visit asap. So glad you enjoyed your weekend away in Charleston. Such a beautiful place! I am totally noting some of these recommendations down for when I head there, I love me some brunch. The hotel looks gorgeous with all the little details and providing bicycle is pretty awesome too! Sounds like you ladies packed a lot into the trip and got some amazing meals. It really is city that you need to eat your way through kind of like Savannah, GA which I loved. What an awesome weekend! I love how much you ladies packed in, and I am so happy I got to meet y'all! I love all of your photos from the Spectator and definitely need that staycation soon! It looks like you girls had the most fabulous time! That hotel looks absolutely spectacular and all that food!!! Eating is by far my favorite part of any vacation and I live for it! It was so hot down here this weekend, I will have to check out that spray. Is snapchat something I need to get on board with? I downloaded it a long time ago but never used it. I keep fighting against it haha! I love you broke down the trip! Such great tips!! It looked like you girls had the best time!! Looks like you guys had a wonderful time. Saving this for my someday trip there! Looks like a fab weekend! The food, the company, the hotel....all of it! I've always wanted to go to Charleston and you just solidified that further! Love your pics and your blog. All of these photos are amazing! I love Charleston and your guide is perfect. I have major wanderlust! Ah I loveee Charleston! The last time I was there was for a wedding-- we did a bar golf bachelorette party during the week and I'm pretty sure we only went to rooftop bars too! Such a beautiful city. So glad you loved Charleston, it's one of my favorite cities! Love Poogan's...we ate there for my bachelorette party dinner before going out! And that hotel looks super fab; I'll have to check it out next time I'm in Charleston! Charleston looks awesome, I'd love to visit there someday! Glad you had fun! Loved seeing some of these photos on instagram! Looks like such a fun weekend and I am majorly jealous. The hotel looks gorgeous and I love staying at a newer hotel, it always feels a bit more fun. You look absolutely gorgeous in all of these photos! 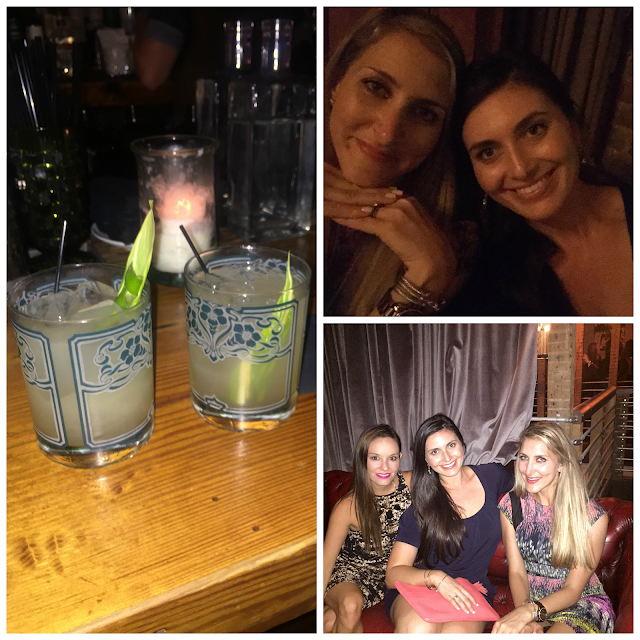 Looks like you ladies had a fabulous weekend! Can't believe you had a bug in your salad! Eep! You are definitely fueling my desire to visit Charleston asap! Fingers crossed it's in the cards for next spring. I'll definitely be referencing all your food picks. Looks/sounds yummy! Looks like such an amazing trip, lady! I loved looking at all the pictures over the weekend. The food looks amazing and y'all looked so fabulous! I LOVE Charleston! That hotel is BEAUTIFUL. I need to check it out next time I am there. Looks like y'all had a fabulous trip. That hotel looks gorgeous! I would have totally freaked if there was a caterpillar in my salad! I need to get to Charleston ASAP! Oh my goodness, HOW FUN! From the beautiful to hotel, to all the great food spots and rooftop views...what a great trip! I love the recap and would love to travel there sometime. Just added you on snapchat (I'm Emmywoo) XO!